Paper Pipedreams | My adventures in papercrafting. I love a parade…err, masquerade! For the woman who likes to dress up, perhaps be a little mysterious, I created this masquerade card. Don’t you love this fashion image from Stamping Bella? It’s called Uptown Girl Marcella Goes to the Masquerade. A fashion greeting card featuring a masquerade mask. I stamped it in Versafine Black Onyx ink onto watercolor paper and then colored it with Tim Holtz Distress Markers in a variety of shades with my water brush. I created an ombre effect on the bottom portion of her dress and overlaid diamond Stickles for some sparkle there and in her eye mask. The bodice of her dress is paper-pieced using a 6″ x 6″ DCWV peach-colored glitter paper from the Glitter Basics stack. I love adding a little bit of pattern to a design this way! Just be sure to edge the paper with a black marker so it blends in with the stamped image. It’s hard to tell in the photo, but I created a soft blue background using lots of water and a couple of blue Distress Markers. A darker shade makes a floor for her to stand on. As a final touch, I ran some clear Versamark embossing ink around the edge of the paper and then heat-embossed using some really cool pink and gold embossing powder from Stampendous. And then I added my go-to rhinestone in the upper corner to balance things out. What an interesting sentiment! Here’s to living life without a mask! As one of three girls, I was immediately drawn to Stamping Bella’s Three Amigas stamp featuring three fashionistas celebrating the holidays. 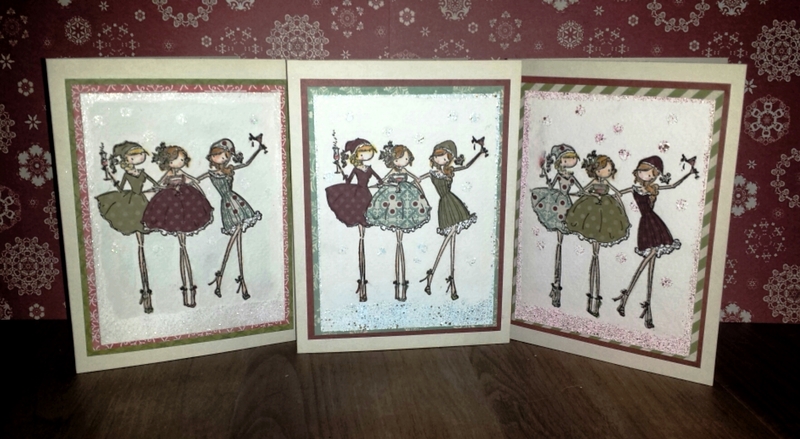 Three Christmas Card versions of Stamping Bella’s Three Amigas fashionistas. I’m always on the look-out for stamps, cards and other items featuring three of anything – cats, dogs, babies – to give my mother. When we were little kids, she used to recite the “three little kittens” rhyme to us all the time. Now it’s a running joke to see what “three little kitten” item I will give her each year. Of course, I had to create three versions of the same card, one for my mom and one each for my two sisters. I stamped them on watercolor paper and used Distress Markers to color them. Then I paper-pieced the outfits and switched them out for each version. One version uses Stampendous’ embossing powder in a sparkly blue around the edges and for the snow while another uses the pink version. The third one uses a clear sparkly embossing powder, so I lightly watercolored the background in blue to make it stand out. I think they’re really cute, and I’m hopeful my family will love them. I challenged myself to send out only handmade Christmas cards this year, and I completed it! My list wasn’t quite as long, and I took a few shortcuts, but overall I am pleased with the results. I love the Christmas fashion stamps by Penny Black. I’ll update soon with the stamp set names. I stamped in black and clear-embossed the images on Bristol paper. I used my Distress Markers in shades of red, pink and green to color them with a water brush. Some of the cards have a dry-embossed layer from a Spellbinders Christmas ornament design, while others I adhered directly onto a preprinted card base. I added a touch of bling with rhinestones, and then I was done! Wood Penny Black stamp featuring a cute Santa outfit. Adorable Christmas Tree dress fashion stamp. Christmas Tree Umbrella stamp by Penny Black. Love this Eiffel Tower Christmas Tree image by Penny Black. 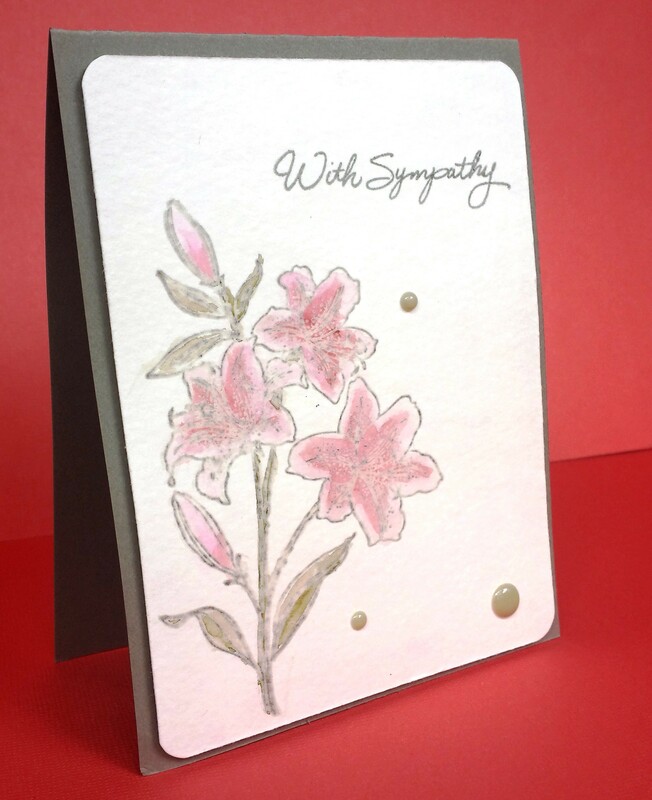 It’s always a challenge to create a sympathy card that conveys your compassionate feelings in a sad situation. I designed this sympathy card recently for my aunt who lost her husband. An orchid sympathy card in grey. Once again I turned to Stampendous’ Orchid Greetings stamp set. The fine line-art stamps of orchids and sentiments provide an elegant impression that is perfect for these types of cards. I created a top-folding card base using grey heavy-weight cardstock from Bazill Card Shoppe. I adhered with foam tape a watercolor panel featuring one of the orchid designs which had been embossed in a greyish white. I watercolored the image with my Tim Holtz Distress Markers and a waterbrush in a variety of subdued shades. Rather than using black ink for the sentiment, I chose a grey ink from Memento called London Fog. I scattered three grey enamel dots and rounded the corners with my Corner Chomper to finish it off. I hope this gives you an idea for your sympathy cards. Thank you for looking! I’ve been wanting to make a summer card and play up the idea of Florida sunshine. Though my intention was for this card to mimic the sun and its rays, I think it could also work as a Fourth of July fireworks card. Sunshine or fireworks? You choose! The design is another variation of my Valentine’s Day card that used a cloud bubble die cut. The original idea came from an Online Card Classes lesson from Debby Hughes using a die cut in a clean and simple design. This one uses the sun die from Lil Inkers Design. I like the tiny dashes in the design. I used 80# white card stock for both the card base and the first layer, which is trimmed a quarter inch from the edge and popped up with foam tape. In the middle I ran the sunshine die cut and layered a small piece of orange patterned paper as the background. 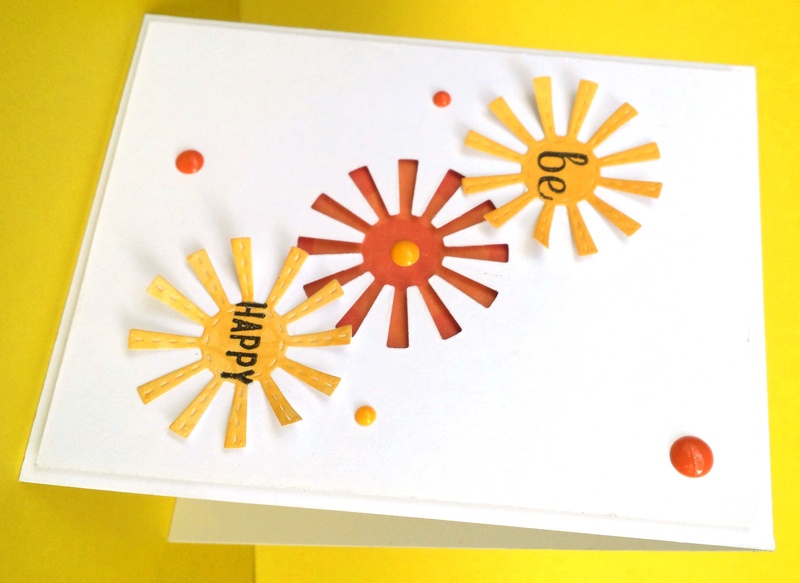 Using the same die and various patterned papers in yellow from the Paper Studio’s A Day at the Beach pad, I created two more suns to flank the negative die cut on the diagonal. It was a challenge to find an appropriate sentiment that was small enough to fit in the sun’s center. I ended up using one of the “be” sentiments from Simon Says Stamp “Be” set and the “happy” sentiment from Simon’s Absolutely on the Edge set. 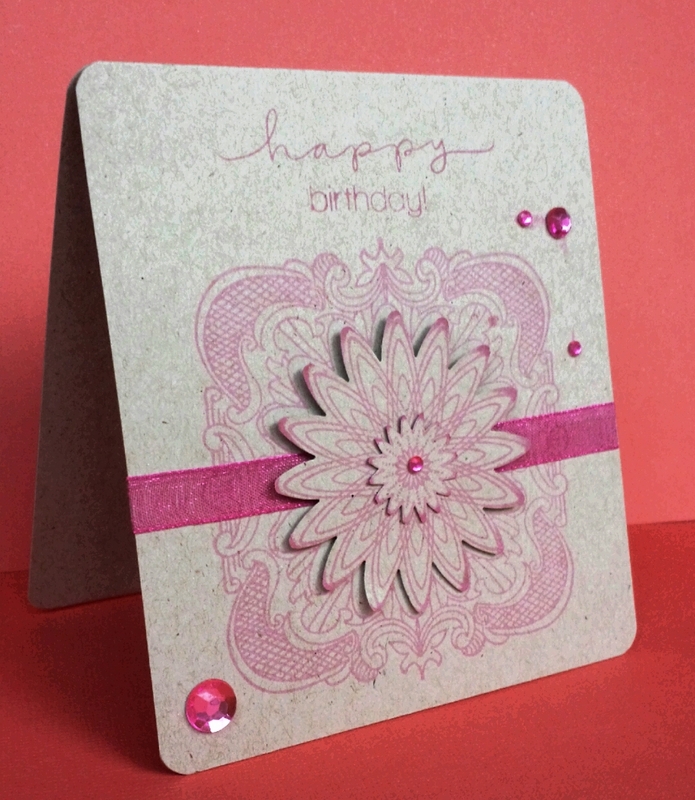 The final touch was scattering some enamel dots in warm shades around the card. What do you think? Does it look more like a sun or fireworks? Either way, I think it’s a fun, happy card for a friend or family member. Have a great summer — and a Happy Fourth of July! I just got some Penny Black stamps and decided to make this colorful birthday card for a friend. Penny Black fashion stamps from Fashion Tweet and Reflection sets. I created the orange card base from Bazzill Card Shoppe 100# card stock, folded from the top. 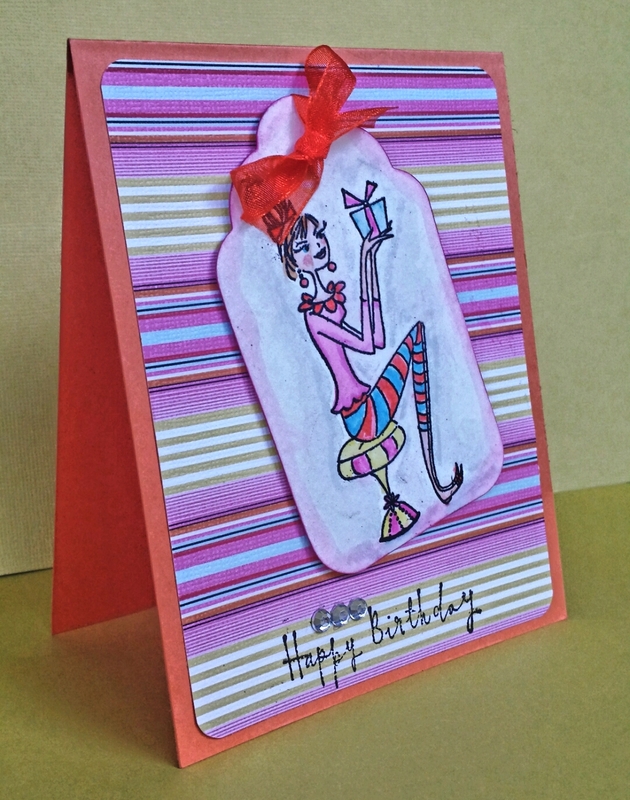 The striped background layer comes from a 6 x 6 paper pad from Little Azalea called Embellish by Dena. I used my corner chomper to round the quarters one-quarter inch. I stamped the happy birthday sentiment from Penny Black’s Reflection set directly onto the bottom portion of the paper. Next I made a tag out of watercolor paper using a Sizzix die and my Big Shot die cutting machine. The stamp of the cute female holding the present comes from the Penny Black set called Fashion Tweet. Using my water brush and the seasonal Tim Holtz Distress Ink Markers, I colored the image using a bright combination of pink, orange and blue, with a little bit of yellow. I also edged the tag using the pink raspberry marker. I tied an orange organza ribbon to the top of the tag and adhered it at an angle using foam tape. The final touch was three clear rhinestones right about the sentiment (conveniently covering up an ink mistake, LOL). I think it will be a fun birthday card for a friend. Please let me know what you think. For both my fashion and wine loving friends, I created a quick greeting card using watercolor paper and this fun stamp from Stamping Bella called Uptown Girl, Opal the Optimist. It’s a top-folding card created from Bazzill Card Shoppe heavy weight card stock. I used Versafine Onyx Black ink on the image and Tim Holtz Distress Ink markers and a water brush to color the image in shades of green and pink. As a special touch, I used Glossy Accents on the wine bottle and wine glass to make it shine like the real thing. After rounding the corners with my Corner Chomper, I adhered a clear rhinestone in the corner for a little sparkle. Then I attached it with foam tape for some dimension. What do you think? I love the sentiment: May your glass always be half full. I’m thinking it can be used as an all-occasion card, whether for a birthday or a simple hello. Here’s a quick card I created for my niece who turns 21 today. She’s a huge Alabama Crimson Tide fan, so I had to go for an elephant theme. A birthday card for an Alabama fan. 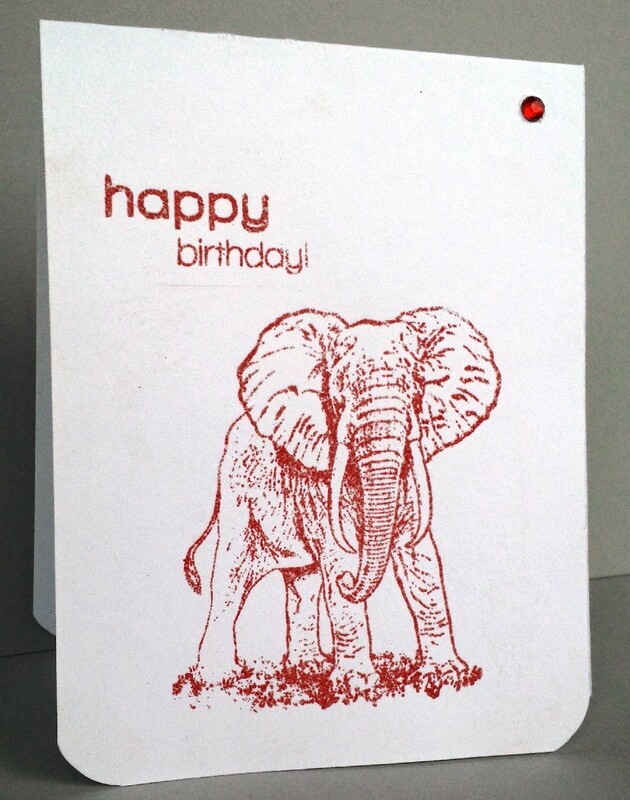 The stamp is a cling one called African Elephant from Deep Red. I heat embossed it on white card stock using Tim Holtz Distress embossing powder in Fired Brick. The happy birthday sentiment is from Simon Says Stamp’s Happy set, also embossed. Although it’s not an exact replica of Alabama’s elephant mascot, I think it’s close enough. I love all the detail, and of course I had to use the Alabama colors of white and crimson. The final touch was rounding the bottom corners with my Corner Chomper and adding a red rhinestone in the upper right hand corner. A clean and simple card. Easy peasy! Happy birthday to my wonderful niece Jessica! Recently I needed to create a quick birthday card, and I was looking for something that looked harder to make than it actually was. LOL! 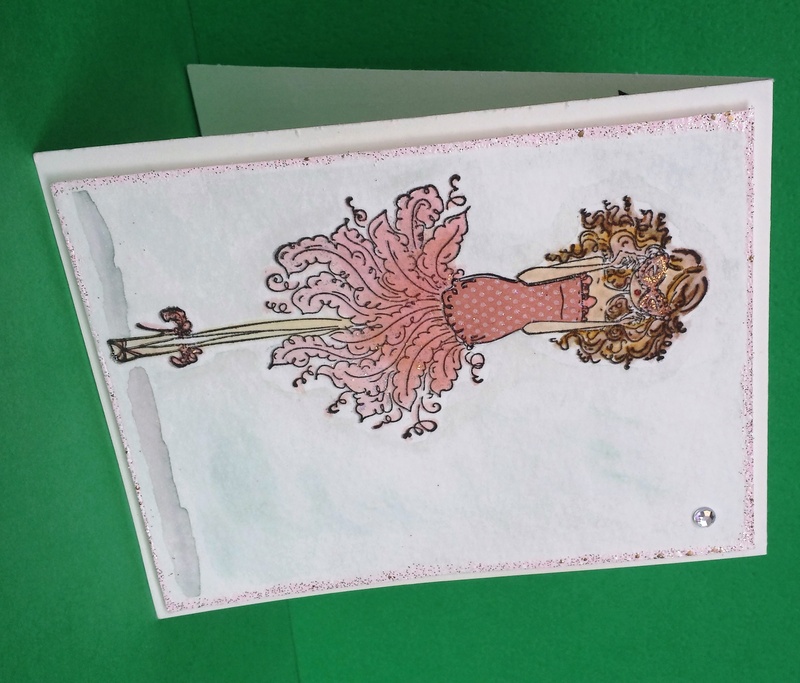 Kraft card stock and pink images for a feminine birthday card. This EK Tools stamp and punch set, Floral Doodle, came to the rescue. I picked this up at Michael’s awhile ago. It consists of several foam stamps of flowery doodles and sentiments. The stamps coordinate and can be layered over one another. It also includes a punch of the main flower image. The box contains several photo examples, and I mimicked one in my time crunch. I used Neenah Desert Storm for the card base and the main flower that’s popped up with foam adhesive in the center. 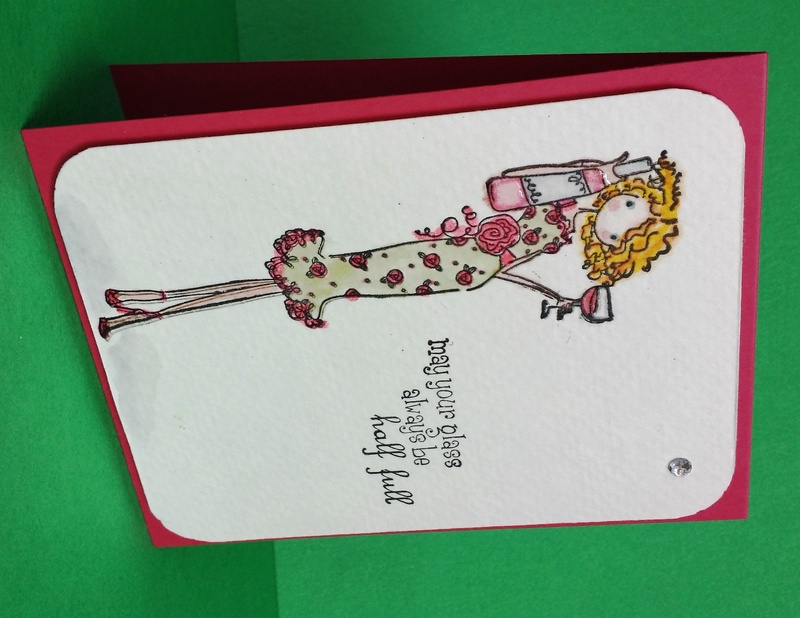 To keep some feminine flair, I used Hero Arts Shadow Ink in Bubblegum to stamp the images in a bright pink shade. I used three stamps in the set: the squared-off doodle on the card base itself; the bigger flower that I stamped and punched out on another layer; and the smaller flower that I stamped and fussy-cut for the flower center. To create a little more depth, I edged the main flower with the same pink ink, using the edge of the ink pad directly to the paper. I added an organza pink ribbon and some pink rhinestones as accents. The final touch was to add the happy birthday sentiment from Simon Says Stamp and rounding the corners with my Corner Chomper. It ended up being an unusual size as I got a little messy with my ink and had to trim off the mistake. Oh, well. I think it still works! 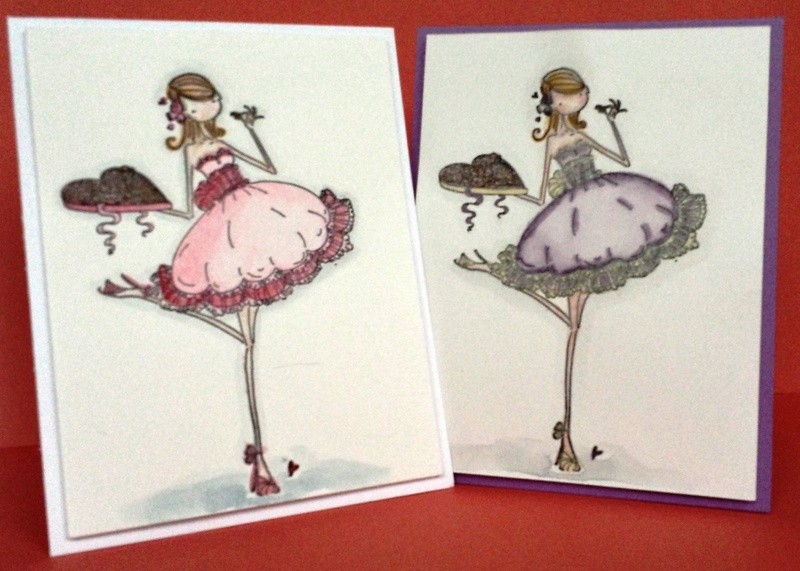 In my final Valentine’s Day card post, here are a couple of cards that I created with a “fashion” twist. A fashionable Uptown Girl with her Valentine’s Day box of chocolates. It’s another simple design with a focus on this adorable stamp from Stamping Bella, Uptown Girl Catherine Nibbling Chocolate. I think it’s perfect for Valentine’s Day–and my two fashionable nieces, Jessica and Hayley. For both, I stamped the image in black Versafine ink on white Bristol paper so I could use a little bit of watercolor but keep it bright. I used a combination of Distress Ink markers and gelatos with my water pen. Then I mounted the images with foam tape for a little dimension. Hayley loves purple, so I colored her girl’s dress with a purple distress marker, accented with a sparkly gold gelato. I like the untraditional color combination, mounted on a purple card base from Bazzill. For Jessica, I went with a more conventional color combination of pink and red. It might be hard to see, but the pink gelato on her dress leaves a slight glittery sheen, which is really pretty in real life. I went with a simple white card base, though I think it would look cute with a pink card base, too. I didn’t bother with a sentiment, since I will write a Valentine’s Day message inside. I wanted to keep the attention on the adorable girl with her yummy box of chocolates. It reminds me of when I was a little girl and my dad would bring home heart-shaped chocolate boxes for his three little girls. We were so excited! I hope you have a wonderful Valentine’s Day–and your own delicious goodies to eat. Thanks for looking!